Keynote & Coffee Break: Dr. Joy James, "Police Violence and the Talented Tenth: Fractionating Civil Rights Leadership"
Professor Joy James is Francis Christopher Oakley Third Century Professor of the Humanities and Professor in Political Science at Williams College. 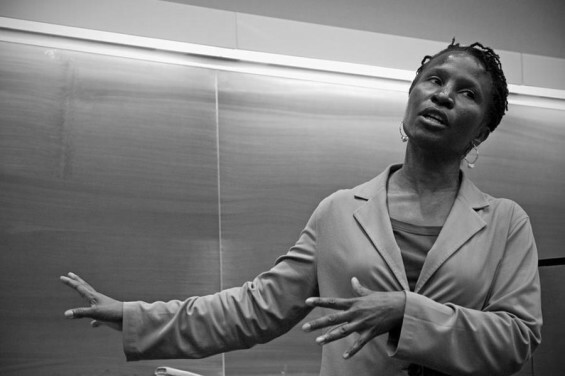 She is the author of "Seeking the Beloved Community: A Feminist Race Reader," "Resisting State Violence: Radicalism, Race and Gender in U.S. Culture," and "Transcending the Talented Tenth." 6:30pm - 8:30pm Civil Rights, Civil Responsibilities: The Community and the Evolving Role of the Police. The relationship between the police and the community is complex and changes with the times. Over the past century, legislation and legal precedent has expanded police authority while simultaneously guaranteeing civil rights to all. Police practice and procedure has developed to define rights and responsibilities of both the police and individuals they encounter. Understanding the history of this relationship can help when reconciling disappointing judicial decisions with common notions of justice, and is necessary to consider when thinking about the future of law enforcement in America. After discussing the "Reasonable Man" standard in conflicts involving police officers, the panel will explore the importance of technology and community policing in the next wave of developments in police procedure and societal accountability. Members of the panel include Wilkinsburg Mayor John Thompson, Tracey McCants Lewis, J.D.,Wesley M. Oliver, J.D.,LL.M.,J.S.D., and Margaret McGannon. The moderator of the panel will be political commentator Lenny McAllister.